UC Cooperative Extension understands that the contributions made by volunteers are crucial to carrying out its mission successfully in LA County. Cooperative Extension is pleased to recognize Milli Macen-Moore's volunteer efforts to improve the health of children through gardening. She is a great example of the spirit of volunteerism at work and Cooperative Extension is proud to call her "our own." Born and raised in Southern California, Macen-Moore started her community work by teaching the residents in her community how to grow their own food as a tool to combat diabetes and obesity. Shortly after, she discovered Cooperative Extension's Master Gardener Volunteer Training Program and became a certified Master Gardener, a decision that changed her life considerably. Since graduating as a Master Gardener in 2009, community service has been a big part of her life. To date, she has volunteered more than 1,400 hours, which is substantially above and beyond the expected 50 hours within the first year of graduation and 25 hours per year for the following years. In order to conduct her outreach and educational activities, Macen-Moore has worked primarily out of the Milagro Allegro Community Garden, located in the heart of Highland Park. The garden was established in early 2009 to integrate urban farming, art and education for local residents who are predominantly low-income, with high rates diabetes and obesity. The garden produces not only fruits, vegetables and flowers, it also helps cultivate creative ideas, artistic expression and community values. Located at 115 South Avenue 56 in the northeastern part of the city, the garden features 10,000 square feet of land divided into 32 raised plots and hosts classes, workshops and community events. Macen-Moore is also a UC-certified Master Food Preserver, sustainable landscape expert, and a volunteer coordinator for Cooperative Extension's Grow LA Victory Garden Initiative and Fresh from the Garden program. She specializes in leading bilingual workshops for children on organic, edible landscapes for self-sustainability. Her goal is to empower children with skills in growing and eating more nutritious fruits and vegetables, as they try to combat their health issues. Over the years, she has developed unique curricula for preschool, elementary and middle school students. 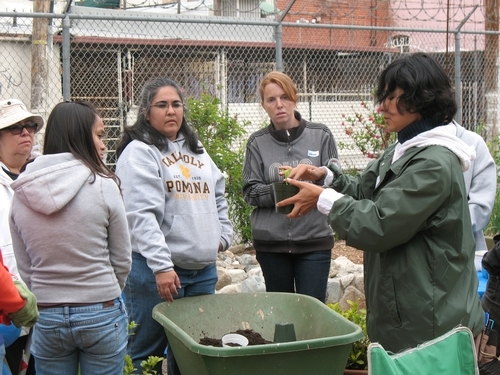 Macen-Moore played a considerable role in the success of LA Sprouts, a local nutrition and gardening program in Northeast Los Angeles for low-income children. The program improved significantly the health, dietary intake and food preferences of participants. They gained less weight than their classmates who did not participant in the program. Along with obtaining valuable nutrition information, students learned how to sow seeds, transplant seedlings, compost, water, recycle and identify various plants. Over the years, she has received many forms of recognition for her community work. In 2010, she received a Certificate of Appreciation from the City of Los Angeles; and since 2009, she has received impressive attention from the English- and Spanish-speaking media, such as KCET, KPCC, Los Angeles Times, Univision, La Opinion and Urban Farm Magazine. Macen Moore is a wonderful volunteer and champion of good health. Cooperative Extension wishes to thank her for all her hard work! Milli is a complete inspiration! That's my girl! Congratulations Milli! Milli, you are the best! Thank you for that Victory Garden training.